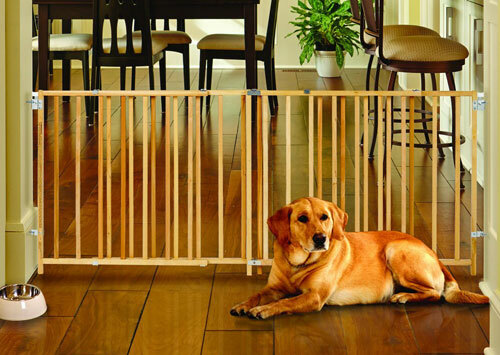 The Richell Freestanding Pet Gate is a suave option, featuring a wooden frame. Unfortunately many plastic and metal pet gates can lack style and elegance. The last thing you want is a fixture that clashes with your home’s aesthetic. 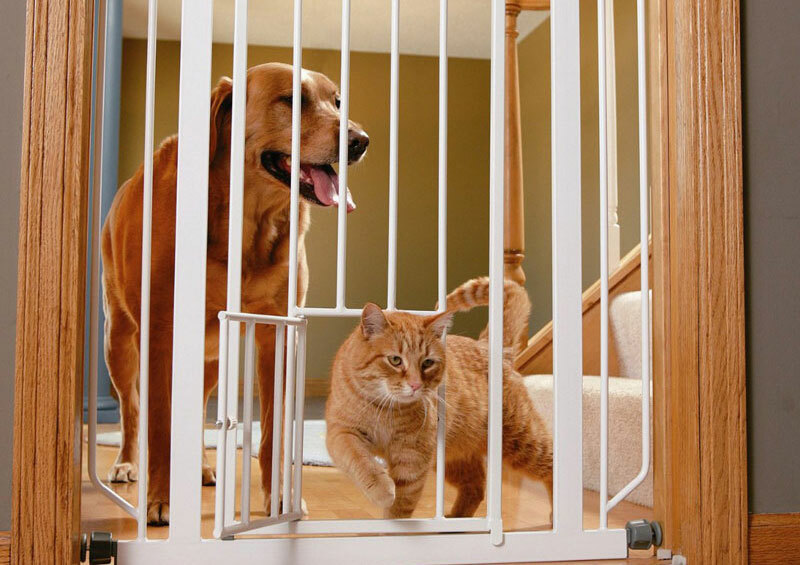 Choosing a wooden pet gate can afford you a more traditional, warm vibe while still providing an effective barrier for furry family members. 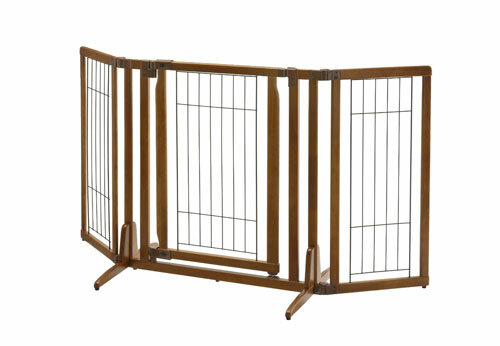 Many wooden pet gate models are freestanding, though you will find some options that are wall mounted. 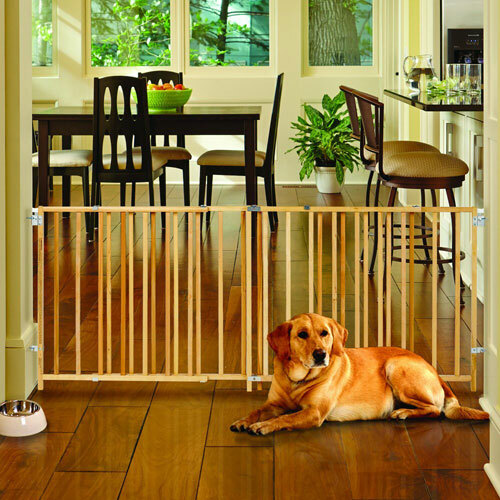 Keep in mind that freestanding models are typically smaller than other types of pet gates and therefore can only accommodate smaller pets. We have put together a list of what we have found to be the best and loveliest wooden pet gates, and we hope that it helps you find the right fit for your home. Hopefully the comparison chart above is helpful in getting a sense of which wooden pet gates may be best for your home. Now we’ll examine a few of the highest rated gates from the table above in more detail. 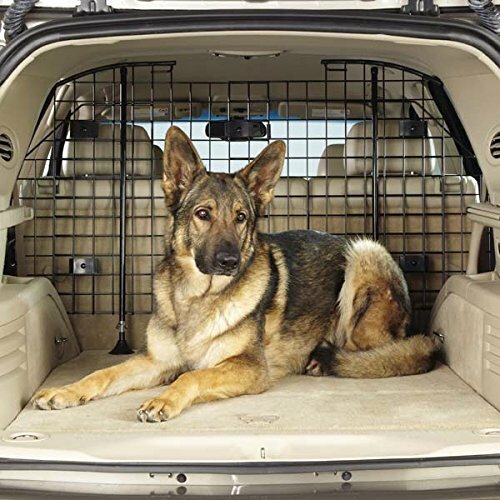 The Richell brand is responsible for a line of highly praised wooden pet gate models, the Richell Premium Plus Freestanding Pet Gate with Door being one of the best. It is made from Rubberwood and 7 gauge metal wire. The bottom sports rubber feet to protect floors. This gate is large for a freestanding model. 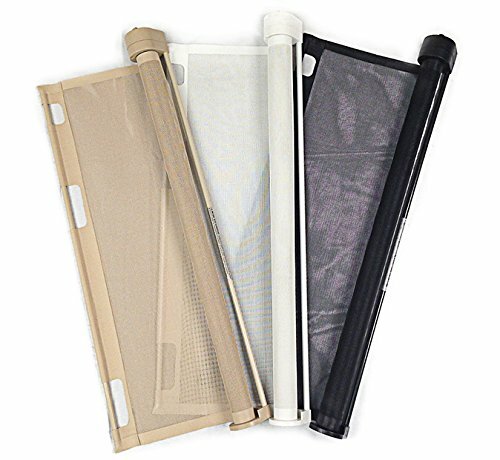 It can stretch to 63 inches wide and is 32″ tall. For frame of reference, most freestanding gates only stand at around 24 inches tall. The gate is composed of a center panel and two side panels. The side panels adjust in 10-degree increments to allow for flexible configurations as needed. An unusual, but convenient, aspect of this gate is that it includes a door. The door is 20.5 inches wide. 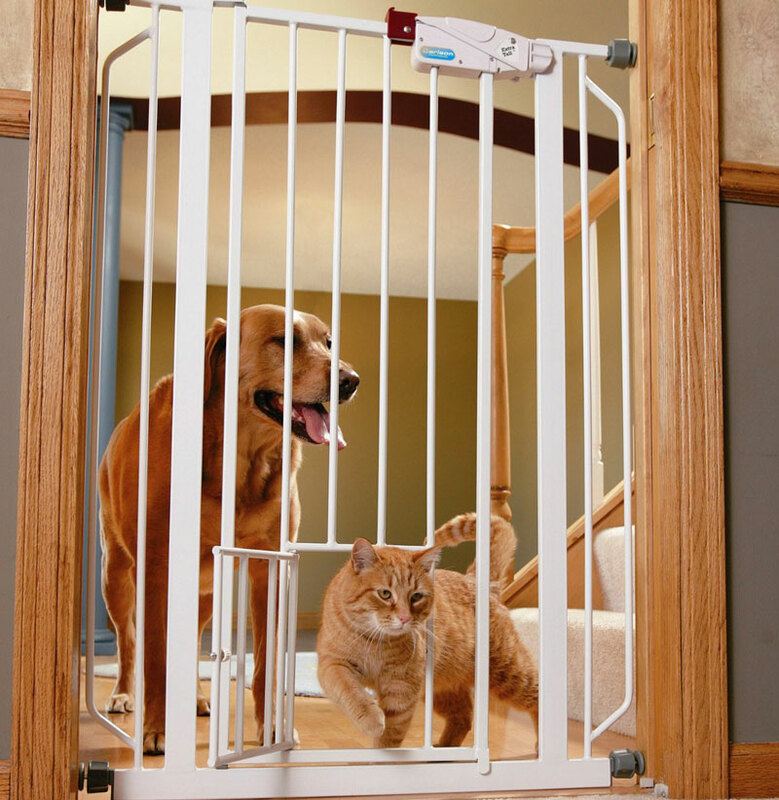 It locks at both the top and bottom for extra security; there’s no way any pet can unlock it. The non-standard features of this gate make it one of the priciest models on our list, but also account for its high rating. 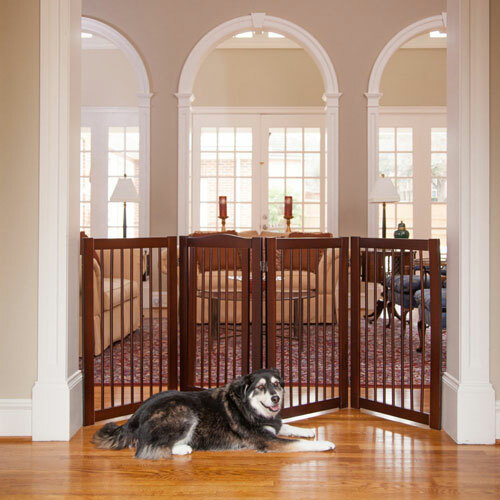 The PRIPM Primetime Petz 360˚ Configurable Gate with Door is constructed out of beautiful Walnut. This freestanding model is the tallest gate on our list. It stands at 36 inches tall, which makes it a giant in the world of freestanding pet gates. It is also sizable in width, and can span spaces up to 80 inches wide. The gate is composed of four wooden panels connected by specialty hinges. These hinges allow panels to rotate 360 degrees, making it so you can form numerous configurations as needed. In addition, a walkthrough door is included in the center of this gate. The door opens both inwards and outwards for convenient pass-through. The North States Supergate X Wide Swing Wood Gate is a wall-mounted model. It is made from natural, non-toxic wood sourced from the United States. This gate is handy for closing off extra large spaces, adjusting to fit openings between 60 and 103 inches wide. It is 27 inches high. It has a childproof latch that allows adults one hand operation. The gate can be set up to swing both ways by adjusting its swing control hinge. When not in use, this gate can be easily removed from its mounting hardware and put away. 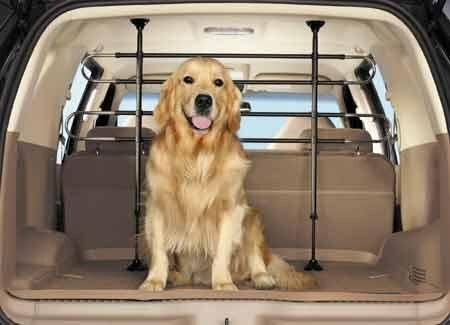 That’s a very convenient feature if your pet is indoor/outdoor or if you entertain often in your home.